To be able to understand icons it is necessary to know how people of the Middle Ages perceived and understood the concept of time. The difference between the concept of time in Western Europe and that in Byzantium was formed in the Renaissance period, when Europe, unlike Byzantium, acquired the new attitudes and outlook towards the world. To be able to understand icons it is necessary to know how people of the Middle Ages perceived and understood the concept of time. The difference between the concept of time in Western Europe and that in Byzantium was formed in the Renaissance period, when Europe, unlike Byzantium, acquired the new attitudes and outlook towards the world. After temporal seizure of Constantinople by the crusaders in 1204 the estrangement between Byzantium and Europe became even more profound and implacable. Different attitudes towards time caused different attitudes towards the world; to the events in it, and to the role of men in these events. As a result, the meaning and objectives of art in Byzantium and Western Europe altered too. 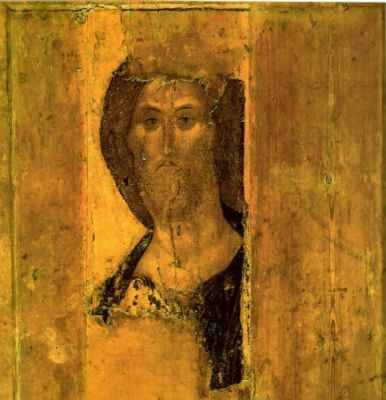 Because of these fundamentally different artistic techniques were developed by the artists of Western Europe and the icon-painters of the Orthodox countries. The Renaissance revived the notion of history and separated Holy History from lay history. The prominent Italians – Francesco Petrarch (1304-1374), Leonardo Bruni (1374-1444) and Lorenzo Valla (1403-1457) began the study of scientific history. Lorenzo Balla, the author of the famous work “Elegances of the Latin Language”, made it his aim to revive classical Latin, where philosophy, rhetoric and language are inseparable. Not only did he have to address the heritage of antiquity, but also to explore the reasons for “language corruption” and culture decline during “the time of barbarism”. All this led to a retrospective review of history and historical time. Time was now related to change, to cause-and-effect relations of events in their historical sequence. The conception of historical succession emerged and, therefore so did the understanding of the depth of time and the awareness of perspective. Discovery of perspective and historical time coincided, in fact, with the emergence of the theories on aerial and linear perspective. Awareness of events, taking place in space and time, resulted in the fact that European artists stopped depicting events that took place at different times simultaneously in their pictures. For instance, in Giotto’s fresco “Birth of Mary”, we can see the girl in two places at one time: in the midwife’s arms, sitting on the floor by the bed, and near her Mother. Such examples are numerous. New attitudes to time and new theological thinking, which recognized free will in a man through which God’s design could find realization, engendered a new man – a man of conscious action. A man, who created the history of his own life, and together with other people – the history of their nation (Leonardo Bruni). This new man could say about himself: “…I make use of my time, being constantly engaged in some kind of activity, I would prefer to lose my sleep rather than waste my time.” (Leon Battista Alberti, “On the Family”). This approach was prominent in the fine arts. Artists began to study the movements of the human body, changes in appearance caused by the mood (anger, joy, laughter, sadness) or ageing processes. Fundamental discoveries were made in this field and the role of muscles and their specialization was found.The understanding of movement as opposed to equilibrium gave rise to new composition methods, for instance removing the center of gravity from the body and showing unfinished gestures in pictures. This technique makes the viewer perceive a prolonged movement in the painting. A passive man of the Gothic period was replaced by a man of free will. Readiness for action, for movement was revealed through the strained muscles and the expression of face and eyes. Looking at the picture we are waiting for action and because of this the picture is alive; the pulse of time is beating in it. In the East of Europe, in Byzantium and Ancient Rus, a previous concept of time and history, dating back to the Fathers of the Church (St Augustine etc.) was preserved. Life of a man is a period of time, having the beginning and the end – from the moment of creation of a man by God to the Second Coming of Jesus Christ. The event that divided history into two parts – the old and the new – was the birth of Jesus Christ, God’s Incarnation. Before the Creation of the World there was no time either. The concept of time can not be related to God. It is impossible to say that God “was” or “is” or “will be”. In Russian it is translated as “existing”, the One who “always was”, “always is” and “will always be” which is derived from the Hebrew name of God – Jahweh – existing (He Brings Into Existence Whatever Exists). God created the world and time “began”. It began and will end with the Second Coming of Jesus Christ, when “there will be no more time”. Thus, time itself turns out to be “temporal”, transient. It is like a “short period” on the background of eternity where God incarnates his design, creating Adam and knowing from the very beginning the destiny of his descendants. God’s design already exists in complete fullness, which includes everything. Time, history, life, all the objects, all the people, all the events, and everything has been given its place. Thus, the cause for any event is not defined in our earthly world but already exists in a different world. God is the source of everything that was and will be. The earthly life of a man is an interval between the Creation of the World and the Second Coming. It is a trial before eternity, when time stops. Eternal life is in store for those who pass this trial. The saints depicted in the old icons have already been found worthy of eternal life. They are devoid of movement and change in the ordinary sense. The blessing fingers of the right hand are not a message from this world. Slender fingers are lifted without effort. They do not have weight, for there is no heaviness in the other world. The gaze of a saint is the look from eternity. It is not blurred by passions – that is why we can only return it in the moments of spiritual enlightenment. That is why the eyes looking at us from the icons disturb us and make us feel apprehension, fear, and hope. What the old Russian icons depict, does not imply either spatial nor time localization. The image exists beyond space and time. Here is the image “The Saviour” by Andrew Rublov (1360/70-about 1430). The eyes turned to us from eternity see everything, understand everything and take in everything and it is precisely for this reason that everything can be found in the Saviour’s eyes, and everybody always, can apply to Him. Peculiar understanding of time and space in Old Russian icon-painting bore fundamental dogmatic meaning. That is the reason why, in the second half of the 17th century when Russian icon-painting started to be influenced by western painting, it evoked so much protest and indignation. Reasons for this were not the conservatism of icon-painting, but apprehensions of misinterpretation of the very sense and essence of the icon. It is difficult to deny that mages can not be painted as though they were alive in icons. The saints are in another world; in eternity, they do not live earthly lives, characterized by time and change.